Share this post with your friends! Are you following Irresistible Pets on Facebook? Twitter? Follow us for free coupons, irresistible pics, discussions, and more! Want to play Wordless Wednesday with your pet blog? Submit your pic to the Blog Paws hop and enter below! I love a good bike ride! Me too. It’s so relaxing! Chuy loves it too! I don’t think my dogs would fit in a handle bars bike basket, but that little guy sure is cute in there. Stopping by from the Wednesday blog hop to say hi! So fun! I tried this with my dog once, and he wasn’t fan, although I wish he would have been! 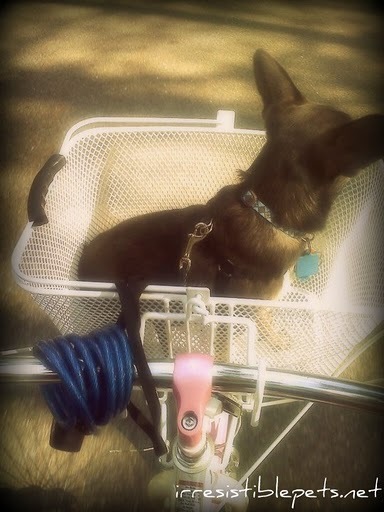 A bike basket is one thing we’ve never tried with Gus – but after seeing this photo of Chuy, we might have to try it! It’s a great way to be able to bring him along – love it! Chuy loves it! You should try it out!! !